In my brown bag this week: Lemon Chickpea Muffins. The classic lemon and cardamom flavor pairing makes these muffins absolutely delicious. While the healthy fats and whole grains create a better for you treat. Eat them any time of day; though I prefer them for breakfast. They freeze well and make a perfect grab and go for busy mornings. Preheat oven to 325°F. Line muffin tin with paper liners. Purée chickpeas, lemon and orange zest and juice, olive oil, sugar and egg yolks in food processor until smooth. Whisk egg whites until they hold semisoft peaks. Fold egg whites into batter. In small bowl, combine sugar and cardamom. Set aside. Scoop batter into muffin tin. Using a generous 1/4 cup of batter for each one. Sprinkle muffin batter with some of the sugar-cardamom mixture. 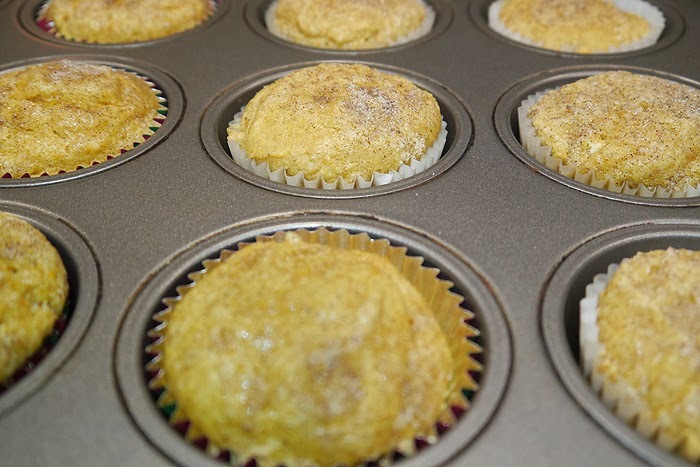 Bake 25-30 minutes, or until toothpick inserted in center of muffin comes out clean. These look really good! It's nice to mix things up a bit!! Theresa, these are lovely! I love citrus of any kind, and you have orange and lemon! ♥ I really like that you used chick peas and whole wheat flour- that would give some staying power if I had of of these for breakfast! We are always looking for new lemon flavored recipes ... we love lemon!! These are different ... will have to give them at try! I made a chickpea bread a couple of years ago and really liked the texture. These muffins would be great dunked into a bowl of soup. I love any and all things lemon! These muffins look delicious. Interesting, I don't think I've had chickpeas in a baked good before. The muffins look and sound delicious. Oh, I am so intrigued by the use of chickpeas...I'd love to try these! I can't wait to try these - I've never put chick peas in muffins before! Chickpeas in a muffin? I'm very intrigued! Wow I love that you used chickpeas in these muffins! So totally delicious. These would indeed be perfect for breakfast!! I have never come across a muffin quite like this...chickpeas?? Interesting! I've been seeing chickpeas in desserts more and more often lately. I'm kind of digging it!